While going through Wiesskunig (1) I came upon a section (p.93) where the book describes how the "young white knight" came proficient in fighting with the Bohemian pavise as well Hussar targe (the former used for fighting on foot while the latter for mounted combat). What struck me as odd was the mention of some sort of "Morthhackn" and "Wurfhackn"(sic) (they seem to be listed as weapons used from horseback and are grouped together with the hussar targe, saber and lance). The only reference that I have been able to find is this http://www.zeno.org/Pierer-1857/A/Mordhaken?hl=mordhaken .... , It points out to a 1860 German lexicon that doesn't say much besides the fact that it was a horseman's weapon. Is anyone mayhap familiar with the aforementioned weapon(s) or terms ? Hmmm, the definition you linked to (for Mordhaken - Murder Hook) seems to indicate that it was some sort of a polearm with a hook (or maybe a spike)... used from horseback and frankly I'm at a loss as to what that could be. 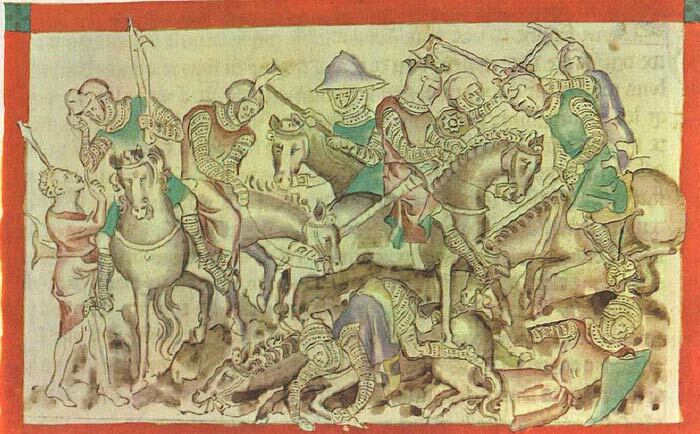 I don't recall people using halberds or guisarme type weapons from horseback but rather against mounted opponents. I'm also at a loss as to what a Wurfhaken could be (litearlly translates as throwing hook). Maybe it's a grapple used in siege warfare... that's really the only thing I could think of. To me, coming from southern germany, it does not sound like "Haken" (hook") but like Hacken or Hacke, and that would mean a kind of axe. So Morthackn ist a kind of battle-Axe or better "Streitpickel", a short hafted cavalry-weapon, and Wurfhacken would mean a kind of throwing axe. They are also mentionend in combination with typical eastern european weapons, like the saber, and were popular on the eastern border of the Holy Roman Empire. A throwing axe from this time also exists, but is rather exotic. I think you didn't translate the passage correctly. First of all he scribes "mit der Morthackn". The male article "der" shows it is clearly no "Haken" (Hook) but a Hackn (Axe). So the proper translation would be: "with the murderaxe", so it would be an Axe wielded from horseback. The second weapon is to be read like: "und mit der Wurfhacken". Again the male article before the word shows, that it is no haken (because if it was so, then he would have wrote "und mit dem Wurfhaken"). So again it's an axe. He means a "throwing axe". That he spells one word "hackn" and the other "hacken" doesn't mean anything, the author wasn't that good at writing, I guess. Later on he spells the word "Volk" like "Volck" and "Volckh" (it translates as "the people"). Wow, Felix, we did post our solution simultaneously! Wow, good catch, I didn't even notice that it's hackn and not haken. I guess I got hung up on the zino.org link which spells it out as Mordhaken, rather than look at the original text (or even the beginning of the post for that matter). Maybe those weapons could be the hungarian "balta" (or "baltag" in romanian in Transylvania) - a bearded axe with a pointed upper spike (like this one from kult of Athena: http://www.kultofathena.com/product.asp?item=...garian+Axe ) and/or the smaller hungarian "fokos" a small axe with a long handle (about 1,20 m or longer) like this one (the picture under the shaman drum): http://www.grozerarchery.com/acc/equip/equip.htm. However I have run into even more strange/exotic looking weaponry whlist browsing through Régi Magyar Fegyverek by Kalmár János. On p.32-33 you can see a strange thing called Hajítóbárd a "throwing axe" or a similar weapon Hajítótüske "a throwing spike". 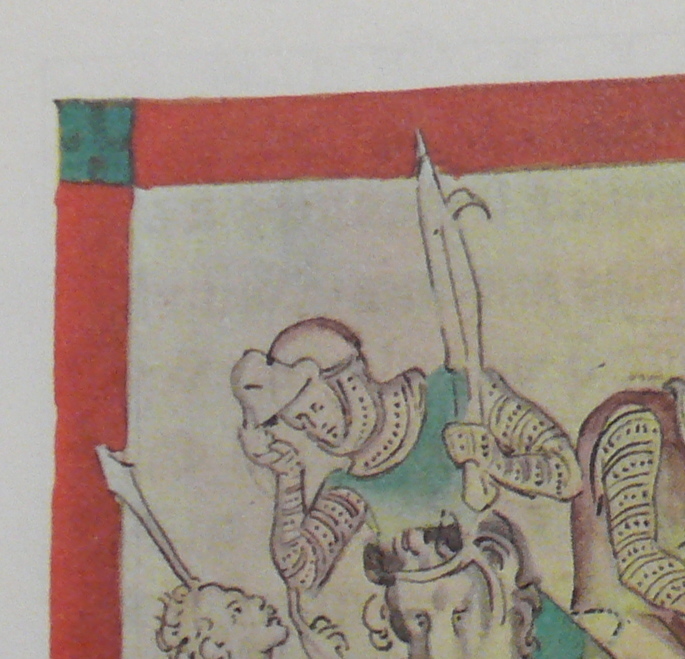 There's even an illustration from Freydal (tournament book of Maximilian I, roughly the same period as Weisskunig) with two fully armoured combatant duelling and throwing the said weapon on each other. Kalmár on p.32 directly quotes Weisskunig and translated the Morthhackn/Wurfhackn into Hungarian as Fokos and Hajítóbárd. He also quotes some later German sources (cca 1580s) that mention "ungarischen Werfbarte". From the book "The Complete Encyclopedia of Arms and Weapons Edited by Leonid Tarassuk & Claude Blair"
"From the 14th to early 16th centuries, a special type of the war hammer was used in central Europe as a missile weapon, which was given a spinning motion in flight. Functionally similar to the throwing axes, these war hammers had a conical pointed head with a spike and a fluke, and the steel handle was also sharply pointed at the bottom. In its simplest form, the throwing hammer had the form of a Latin cross whose four pointed arms were designed to inflict a wound however the weapon hit." A missile weapon shaped as a cruciform hatchet, made of steel. Its blade was forged into a sharp tip and balanced by a pointed fluke; the short handle was similarly pointed at the bottom and often extended into a spike on the top. Analogous in use to the WAR HAMMER, throwing axes were quite popular in central Europe between the 14th and 16th centuries. I'm not sure where the term Hurlbat comes from. I couldn't find it in the Complete Encyclopedia of Arms book. Perhaps someone else knows if this term was used in period or if its a modern invention?